What do your piano prices include? Standard local delivery to ground floor and 12 months guarantee. 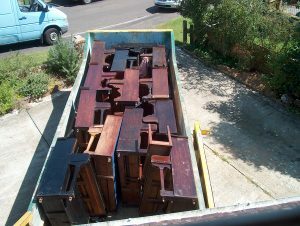 Do you buy or dispose of older pianos? This is a very common enquiry. Although we occasionally sell pre-war traditionally styled pianos, we very rarely buy them, they are almost always part-exchanges. For every p/x which is in good enough mechanical order for us to supply, we will have disposed of at least a dozen. Given the low demand for these, we nearly always have more than we can use. The other problem is that of disposal, which is not as easy as it sounds. Council recyling centres don’t normally accept pianos, and in any case waste disposal facilities require a Trade Waste Licence, which I don’t have. My only method of disposal is to employ a specialist, or to hire a large and expensive skip. See below. Do you hire pianos for functions? Yes. 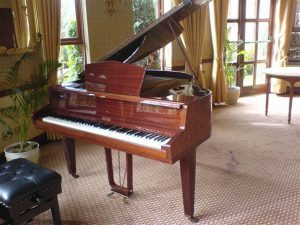 We have a small Geyer baby grand, first picture below, which is ideal for wedding receptions or other hotel functions. 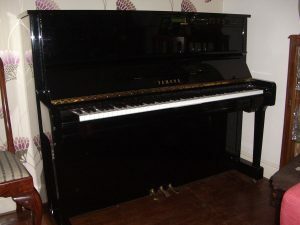 We also have a Yamaha upright, second picture below, which is useful for smaller venues such as pubs, clubs, etc. The piano is an MX100, essentially the same as the U1, but with the additional Disklavier function. Prices vary according to distance and access, so please contact us with your requirements for a quotation. Do you rent pianos long-term? No, this is not a service we offer. I did at one stage look in to the possibility as we receive regular enquiries about this, but decided that any long-term rental deal offered would not be in the client’s interest. Rental is a very expensive way of acquiring a piano in my opinion. Do you buy or sell electronic/digital pianos? Not normally. We have occasionally taken electronic keyboards in part-exchange, but would not supply them as a matter of course. We do not repair these keyboards, and recommend the original supplier for ongoing repairs. What are your opening hours, and can we visit at weekends or evenings? I don’t have specific opening hours, being primarily a mobile tuner. Generally, I carry out most of my tuning work on weekday mornings, so most afternoons, evenings, weekends and Bank Holidays are the best times to visit my workshop, but please be sure to call or email in advance to arrange a convenient appointment. Do you service pianos supplied by Winchester Pianos? Yes, at our standard rates. Winchester Pianos ceased trading earlier this year, but we are happy to tune or service any pianos sold by them. However, we are not connected with the company, and have no responsibility for any warranties they may have given.